According to the Environmental Protection Agency (EPA), you spend 90% of your day indoors. The trouble is, air pollution in your home may be up to five times worse (or in some cases 100 times worse) than the air outside. The invisible contaminants in your home’s air are a real and growing health concern. Indoor air pollutants like mold, bacteria, pet dander, viruses and dust mites can adversely affect your family’s health. According to the American Academy of Allergy, Asthma and Immunology, 50% of illnesses are caused, irritated, or aggravated by poor indoor air quality. There are a variety of air cleaners on the market today. They each have different purposes and functions. Most air cleaners are simple filters which trap contaminants. The alternative is a germicidal UV air cleaner. UV air cleaners are mounted inside your heating and cooling system along with your regular filter. The UV lamp inside emits powerful rays of ultraviolet light to kill harmful air pollutants. Because a germicidal UV air cleaner is mounted in your duct system, it improves the quality of your indoor air and circulates the cleaner, healthier air throughout your entire home. UV germicidal lights offer whole-home indoor air quality improvement. 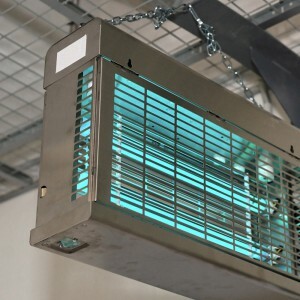 They operate invisibly and silently and can also improve your heating and cooling system’s efficiency by eliminating microbial build-up on system components. At Acree Air Condtitioning, we have the indoor air quality solutions to help your family breathe cleaner, healthier air. Speak to one of the indoor air quality experts at Acree Air today by calling 1-800-937-6736 or filling out our online form.